PEER presents The Numbing Vibrancy of Characters in Play, new paintings by Jadé Fadojutimi in her first solo exhibition in a UK public institution, including large-scale works specially created for the gallery’s street-facing space. Fadojutimi is a young artist who has developed a vibrant and distinctive language of painting that fluctuates between abstract gesture and repeated forms or motifs that seem to exist on the very edge of graphic description. For her, the stretched canvas provides a physical space onto and into which she can enact a variety of scenarios where the material of the paint itself has the power to assume a vast range of identities. Tickets are £5 or £3 for concessions and can be purchased via the link below. There are a limited number of tickets and we are expecting high demand so booking is essential. "The three-screen film installation my camera seems to recognise people, 2015, presented recently at PEER, challenges the assumed passivity of the camera. In a world of facial recognition, the camera doesn't just document what is in front of it, it makes sense of it." "How often does a lie need to be repeated for it to be accepted as truth? How many times do you need to voice a hope for it to appear possible? Can an image erase another image? How can you make people doubt their own memories? How do you make a story disappear?" If you missed the exhibition at PEER and LUX, you can access belit sağ's work through her Vimeo. PEER is very pleased to announce that we will be presenting a solo exhibition of Juan Araujo's work from April – June 2019. Araujo will be focusing on two specific kinds of British modernism, namely the works of Henry Moore as shown in the sculptor’s preferred context of the English countryside, and Brutalist architecture. PEER is seeking to commission a dedicated and inspiring artist with experience in developing participatory and socially engaged art projects and a strong will and desire to work with people and communities. 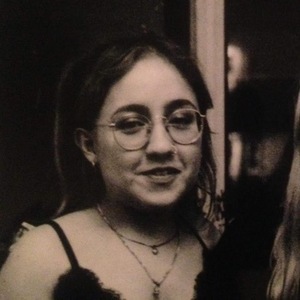 The artist will collaborate with young people involved in PEER Ambassadors to create engaging artworks and events for local people in Hoxton, as part of our new initiative, PEER Notices. PEER Ambassadors is a programme that provides paid employment and free cultural learning opportunities for young people from BAME and lower socio-economic backgrounds. We are delighted to welcome Cora Sehgal Cuthbert, who joined the PEER team in January as our Gallery Trainee intern. 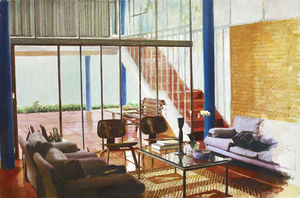 Cora is a recent graduate of City and Guilds of London Art School and a practising artist. 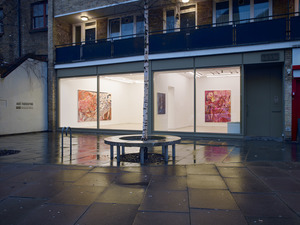 Her work explores the connections between the personal, cultural and spiritual, particularly within the area of East London. 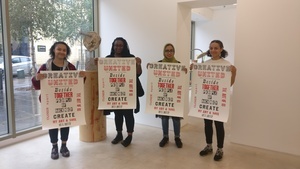 Our Gallery Trainee internship has been running since 2015 in partnership with Creative Access – an organisation that is dedicated to recruiting BAME talent in the creative industries and provides mentoring and networking opportunities. 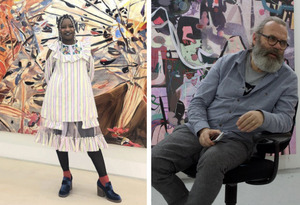 50% of funds for this post were raised through the Khadija Saye Memorial Fund, who was our first Gallery Trainee in 2015/16. Arden Gardeners is an exciting new public art and gardening project in collaboration with PEER’s neighbours, the North and South Arden Estate, generously funded by Groundwork’s Our Space Award. Artist Finn Thompson has now installed the new benches as part of this project. 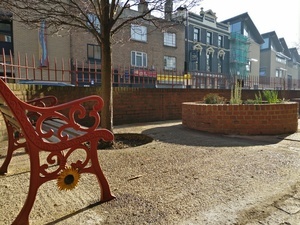 Harking back to the Victorian heritage of the Britannia Theatre, which once stood where the flats are now, the benches have been made using reclaimed cast iron bench ends, recycled plastic lumber and featuring sunflower and thistle designs that were chosen by residents. PEER is thrilled to announce that we have been awarded a two year grant of £50,000 by Paul Hamlyn Foundation to fund PEER Ambassadors and PEER Notices. Pioneering schemes will provide opportunities for local young people from BAME and lower socio-economic backgrounds and artists to work together on public art projects.